b. For Physiotherapy HSC/equivalent (Science)examinations for all education programs in country and abroad will be at least 7.00. But can not be alone under GPA 3.00.
a. 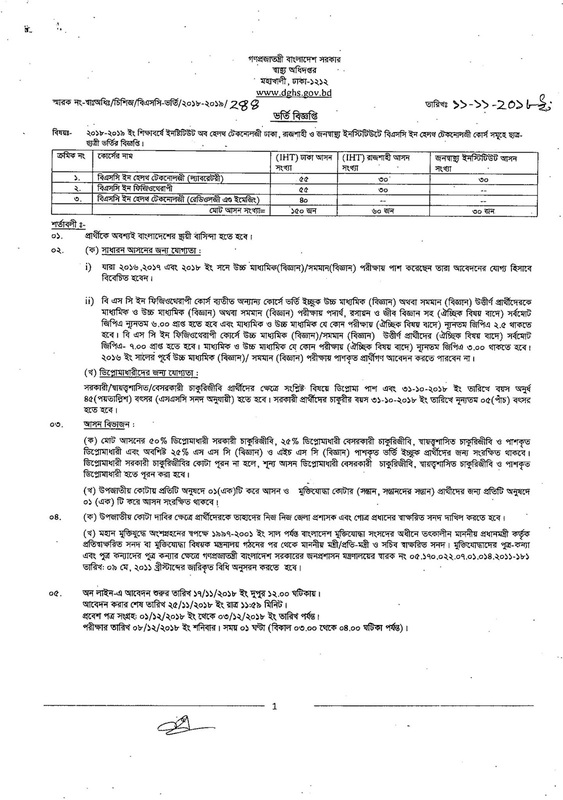 Government and Private diploma Candidate must be age 45 on 31-10-2018 and Service Age 5 year on 31-10-2018. 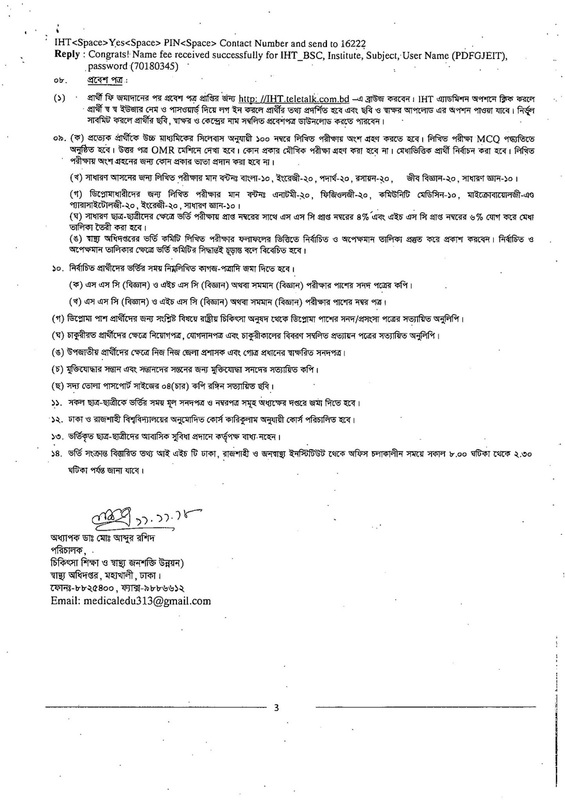 Every interested student can apply for Institute of Health Technology via Teletalk Mobile Operator below instruction. Confirmation Reply: Congrats! 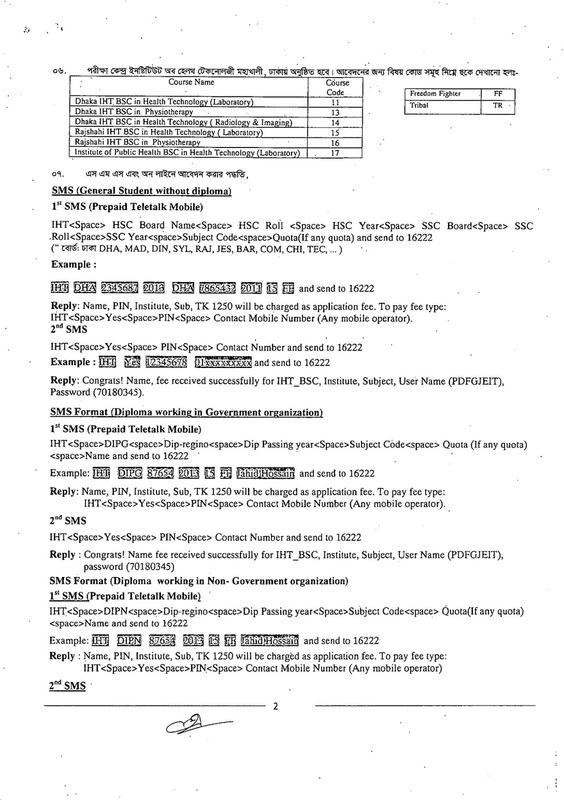 Fee received successfully be for IHT_BSC, Institue, Subject, User Name (GLASYSKEK) AND Password(a2rsss7su). 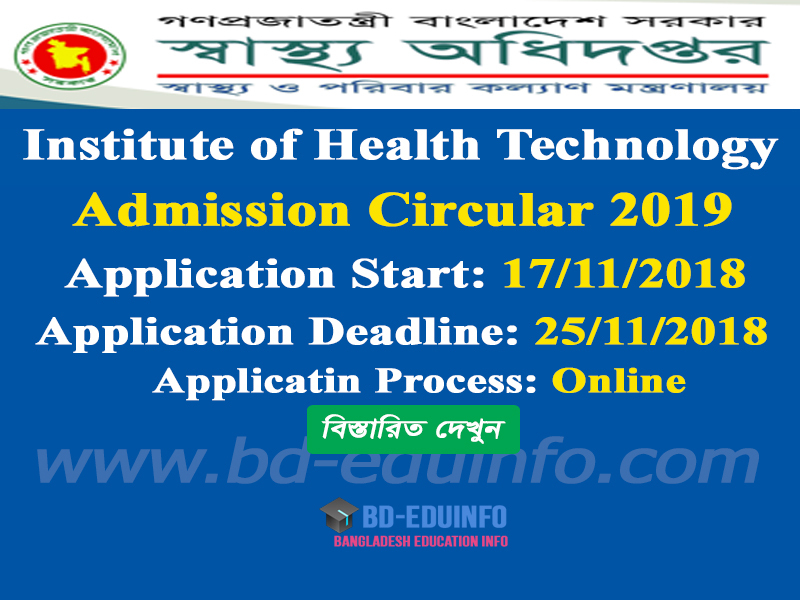 Institute of Health Technology Admit Card Download: Institute of Health Technology authority will published 01/12/2017 to 04/12/2018 at http://iht.teletalk.com.bd/. Every candidate can download specific time and date their official website . b. Go to http://iht.teletalk.com.bd and Input your User ID and Password. 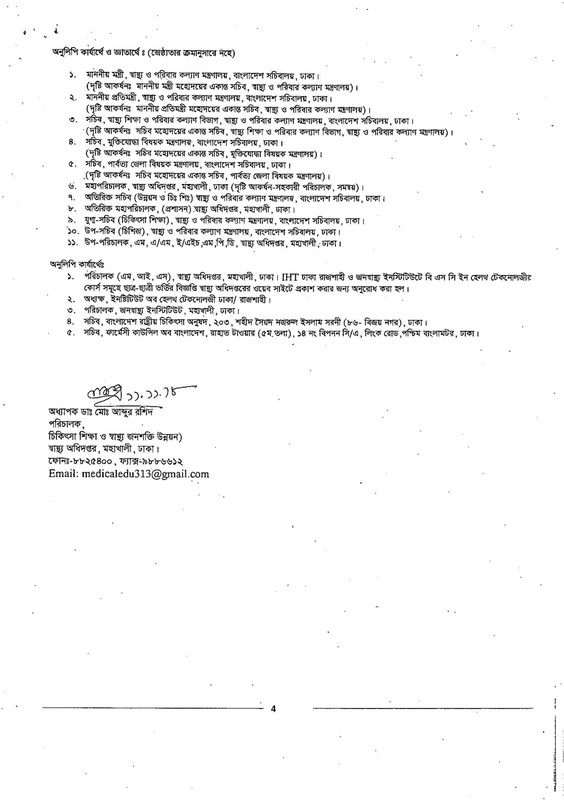 Institute of Health Techonology Admission Examination Center and Test Seat Plan will publish RMSTU official website http://www.dghs.gov.bd/. 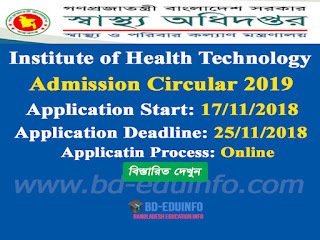 Institute of Health Technology admission result publish on official website http://www.dghs.gov.bd/. 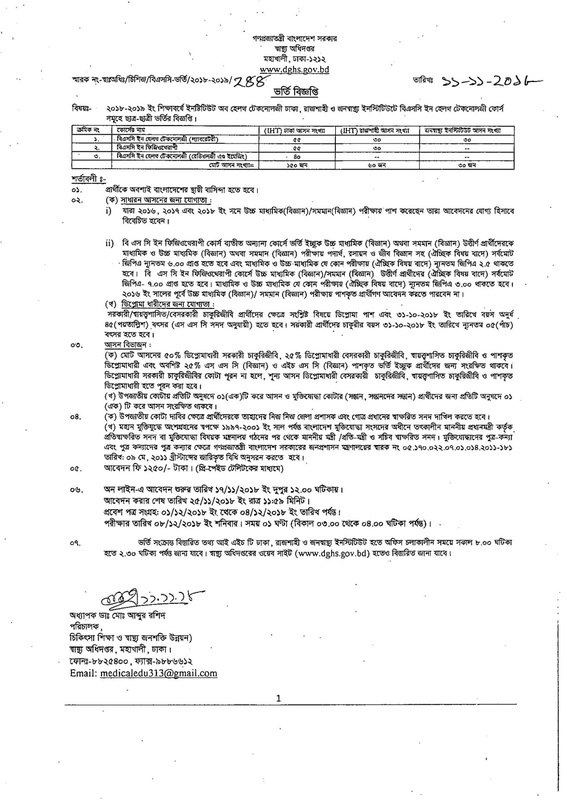 Tags: www.dghs.gov.bd, www dghs gov bd, iht.teletalk.com.bd, iht teletalk com bd, Institute of Health Techonology Dhaka, Rajshahi and Jonshasto Institue admission notice for B.Sc in Health Techonology (Laboratory), B.Sc in Physiotherapy, B.Sc in Health Techonology (Radiology and Imaging) Admission Admit Card 2017-2018, Institute of Health Techonology Dhaka, Rajshahi and Jonshasto Institue admission notice for B.Sc in Health Techonology (Laboratory), B.Sc in Physiotherapy, B.Sc in Health Techonology (Radiology and Imaging) Admission Result 2018-2019.